Truck accidents often result in higher settlements for injury compensation to victims. Factors that are taken into consideration in calculating truck injury compensation differ depending upon the injuries suffered and whether or not the victim died as a result of the accident (fatal accident cases are usually called wrongful death claims). Degree of fault of the drivers involved in the accident. If the incident is determined to be completely the fault of the truck driver, you may be entitled to compensation for all your injuries; otherwise, if you are determined to be partially at fault for the accident, you may find that the truck injury compensation you receive is reduced by the percentage of fault assigned to you. Severity of injuries sustained. This portion of your truck injury compensation includes the impact of your injuries on your ability to function in your daily life as well as how long the injuries lasted and whether or not they continue to cause future disability. Cost of medical care required. Your medical care costs include the amount of care required as well as hospital stay expenses, surgeries, and rehabilitation and home care costs. Degree to which injures you suffer are related to the truck accident. Sometimes before compensation can be fully calculated, expert medical opinions must be obtained to determine if injuries are actually related to the accident or if perhaps some pre-existing condition contributed to a victim’s severity of injury. Amount of insurance coverage the truck driver carries. You can only receive truck injury compensation to the extent that the trucker, his company, and other responsible parties are insured; policy limits could be a limiting factor, though sometimes personal assets are available as well. If your case is settled or goes to trial. A truck accident case that goes to trial is dependent on the verdict of a judge or jury. If your case is decided by a jury. Many times jury member’s prejudices, sympathies, and perceptions can either increase or decrease the truck injury compensation awarded to you—an unpredictable factor. 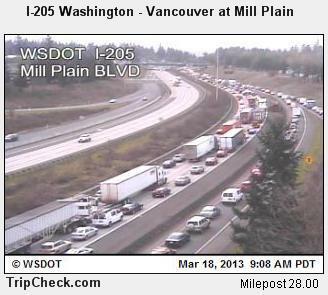 On Monday, March 18, 2013 many of the 60,000 or so Clark County commuters who use I-205 reported late to work due to the collision of a wrong-way truck with an oncoming vehicle. The crash occurred early in the morning when a semi-tractor trailer driver, after leaving a truck stop on Interstate 84, entered the roadway headed in the wrong direction and continued on the wrong-way route for several miles before the crash occurred. Police, upon receiving a 911 call about the incident pursued the truck and attempted to put down tire spikes to stop the 85-mph-moving truck, but were unable to stop the truck before the accident. Commuters faced hours of gridlock conditions until the accident was cleared. According to reports, one person was taken to the hospital with non-life-threatening injuries, a police car was damaged, and the truck driver was treated at the scene of the accident and carted off to jail. With the accident still under investigation, it could be a while before all the details of the accident are released. In this case, the truck driver was very obviously at fault for the victim’s injuries, and the victim may be able to file a claim for truck injury compensation. At Shulman DuBois LLC, we assist victims of truck accidents in obtaining the truck injury compensation they are entitled to. With experience in the negotiation of truck accident settlements and truck injury litigation, Shulman DuBois LLC are Portland personal injury attorneys you can depend on to see that you get the compensation you deserve. If you or a loved one has been injured as the result of a truck accident and need legal assistance, please contact us for a free consultation concerning your claim at 503-222-4411.